You are here: Home / Inequality / Publix: Listen to women like Sylvia on International Women’s Day. Publix: Listen to women like Sylvia on International Women’s Day. Click here to ask Publix to sign the Fair Food Agreement. It’s Day 4 of the Fair Food Fast and today is International Women’s Day. In our time of morning prayer the farmworkers recognized the strong women among them who are pillars of the farmworker community. 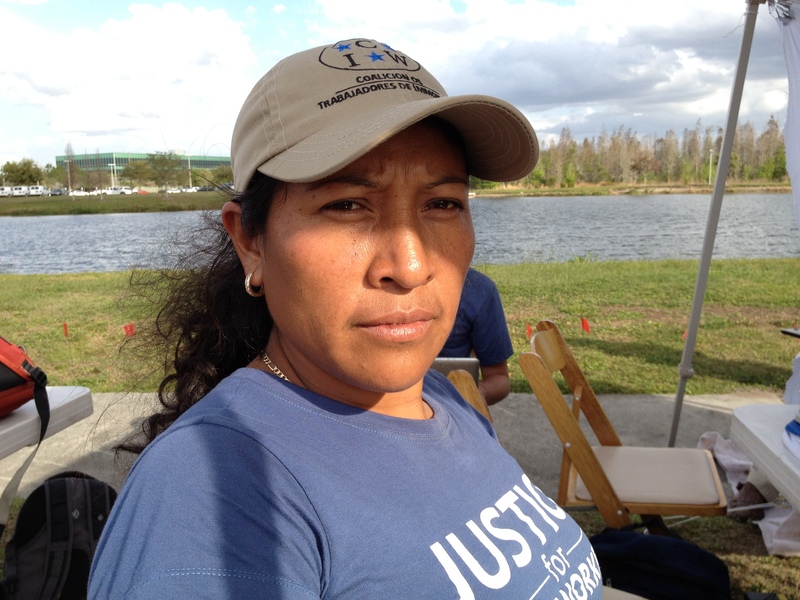 Sylvia Perez waits for hours each morning, unpaid, until tomato growers pick her and other workers up for a day of work. Meanwhile, her two children are at home without her. early in the morning, and then driven by truck (sometimes a closed “box” truck, or bus for two hours to a farm for a hard day of work in the hot Florida heat. The hours spent waiting and riding the bus is unpaid time. It is also time away from her family. Sylvia has two children: her oldest a girl named Candice is eighteen, and her son, Leias, is seven years old. Sylvia has harvested not only tomatoes but also cucumbers and blueberries as far north as Delaware, and tobacco in the Carolinas. She has seen, and experienced herself, abuses that are typical for women working in the fields. “If you’re a woman there is a general lack of respect and you can be taken advantage of…and you can’t do anything about it. If you speak up you will lose your job.” Breaks are so rare as to be nearly non-existent and no shade is provided for even a moment’s relief from the heat. The buckets for the tomatoes must be filled well beyond the top rim and to the fickle satisfaction of the “contractors” who oversee the workers. There have been ligated cases of forced labor and farmworkers are subject to gross instances of wage theft and physical abuse in the fields. But all of that is changing since the institution of the Fair Food Program and the principles to which growers and buyers like Burger King, McDonald’s, and Aramark have agreed. Wages were raised by a penny a pound resulting in about a 60 percent increase in pay and workers need no longer fear losing their jobs if they report abuses, indeed, abuses have dramatically declined. Ten corporations in all have signed the agreement. The categories of corporations that have signed are fast food restaurants and food service providers. What’s missing is significant participation of supermarkets. Publix is a leader in the southeast, especially in Immokalee, Florida, where 80% of the tomatoes we consume in the U.S. are harvested. Sixty farmworkers and allies are fasting for fair food. Publix continues to ignore our presence and our desire to dialogue with them.